We’re living in perilous days—but you can help do something about it. I’m not referring to anti-Christian secularism in the West, to Islam, or to another external threat to God’s people. These realities are troubling, but they’re secondary to our real problem—professing Christians don’t know the Bible. More than eight in ten self-identified born-again Christians in America think the Bible teaches that “God helps those who help themselves.” Sixty percent of Americans know fewer than five of the Ten Commandments. Since the Lord saves people via the preaching of the biblical gospel—God’s power unto salvation (Rom. 1:16–17; 1 Cor. 1:21)—the church has an ineffectual witness when it doesn’t preach and teach the truths of Scripture. Through Ligonier Ministries, friends like you send reliable teaching across the street and around the world that enriches people deeply in God’s Word and helps them shine as lights (Matt. 5:16). The summer months are challenging for us, and we need your support so that we do not have to reduce our global outreach. In God’s providence, this work is donor-supported. Your gift of any amount will help us bring God’s Word to many people. 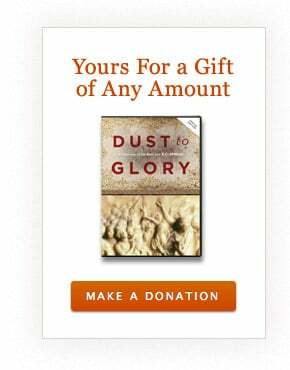 To thank you for your gift, we will send you the complete Dust to Glory Bible overview teaching series from Genesis to Revelation on DVD, as well as another DVD for your computer that features the audio version of the series and a study guide. Will you assist us in training people in the Scriptures? Note: Offer expires 8/31/14. Please allow up to 6 weeks for delivery after your gift is processed. Contributions are tax-deductible as allowed by law. For federal income tax purposes, the deductible portion of your charitable contribution is limited to the excess of the money contributed over the value of the goods provided. Our good faith estimate of the value of this resource is $10. Offer valid in U.S. and Canada only. Thank you for your support.